The study of genetic makeup and DNA sequencing has generated massive interest over the last half a century. Knowledge and research on Genomics have become indispensable for medical diagnosis, forensic biology, virology, and biotechnology. With a keen focus on targeted therapies and data-driven drug manufacturing, it is estimated that the genomics data market is going to hit $27 million by 2025. The human genome is made up of over 3 billion cells. This vastness and complexities of the genomes have generated massive computational challenges for genomic studies and research. In fact, the first human gene sequencing done in 1979 cost around $100 million. Over time the cost of conducting high-intensity gene sequences has reduced dramatically. Today the cost of a complete genome sequencing is around $1000 to $3000. Some new technologies are even promising to lower the cost to below $100. With cheaper genomic analysis health services are going to eventually reduce dramatically. Traditional genomic researches are however faced with a myriad of challenges ranging from a lack of incentives, data centralization, and misuse, privacy concerns, interoperability, not to mention complex computations. These challenges have led to the inception of blockchain in the industry to help ameliorate these challenges. Blockchain offers a decentralized, immutable and fault-proof ledger that can be used to solve some of the aforementioned challenges. 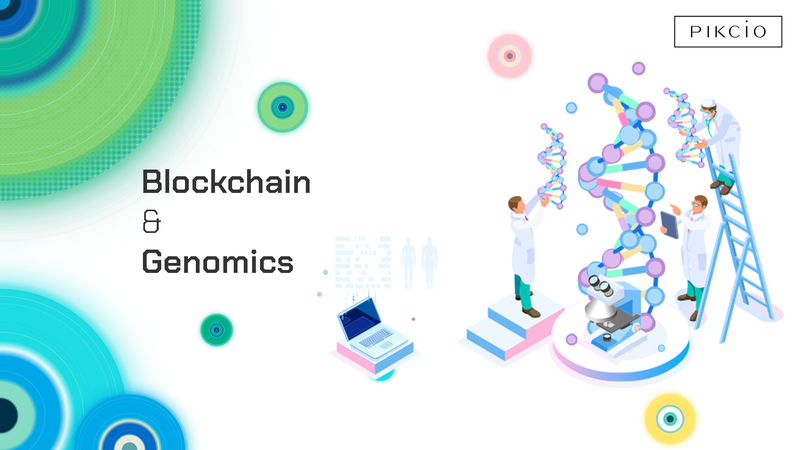 This article aims at serializing some of the challenges of genomic study and research and provide possible blockchain solutions and applications, whilst discussing some of the ongoing developments in this sphere. One of the most critical challenges facing most research systems and in particular those of the healthcare system is interoperability. Most of the healthcare data is organized in vertical silos and hence most researchers fail to grasp a broad understanding of issues and facts. The result is the development of suboptimal drugs and clinical interventions. Besides, interoperability genomic research is faced with the challenge of finding appropriate data. Persons with rare genetic disorders are spread out across the globe and it is virtually impossible to get hold of these people for research purposes. According to Dennis Grishin a co-founder at blockchain startup Nebula Genomics, most genomic studies receive data from patients who have been affected by a particular disease in the hope of finding a cure. The rest of the population who have not witnessed the travesties of a disease are less likely to donate their data for research. The results from the subsequent studies will, therefore, be rather skewed. As mentioned earlier the process of genomic processing requires a substantial amount of computational resources. Researchers have to consolidate centralized repositories and standardized file transfer protocols. While these mechanisms are largely effective they create significant challenges in terms of centralized servers which act as mediators while creating a single point failure. These, in turn, hamper the systems integrity and privacy which are critical components given the sensitivity of genomic data. Blockchain feature-rich properties can help in addressing some of the problems described in the preceding paragraphs. Overall the application of blockchain in genomics can be summarised as computational and storage resource sharing, decentralization of data distribution, enhancing interoperability and enhancing data privacy. Blockchain computational capacity is far much enhanced than the Berkeley Open Infrastructure for Network Computing (BOINC), which is perhaps the most powerful computation grid available today. Blockchain is able to handle compute-intensive process such as read mapping. Blockchain will also be handy in reanalyzing and restructuring algorithms and reference databases which are constantly evolving in genomics. Blockchain decentralized nature is also largely essential for improving interoperability and data sharing. With distributed data storage its far much easier to share information between researcher, biotechnology companies and data subjects. Providers who wish to sell or donate their data on the blockchain platform can make use of asymmetric cryptography to encrypt the data. To access the data the receiving end has to possess a decryption key. With the addition of immutable timestamps, data shared on the blockchain network is highly protected against intrusion, theft, and corruption. The advent of smart contracts in the blockchain network is further revolutionizing the art of transaction and data sharing. Smart contracts will automatically execute certain functions of the system whenever some conditions are met or unmet. Smart contracts will actualize the concept of offering an incentive to data donors and system users by implementing permission-based sharing and interactions. Smart contracts will also provide increased autonomy to users as they can choose what information to share and whom to share it with. There are several ongoing projects that are geared towards leveraging on the benefits of blockchain in genomic research. One of the companies causing major ripples in the industry is Russian Biotech company Zenome. The company aims at leveraging on the power of blockchain and genomic data science to give consumers more control of the sale and use of their genomic data. In the recent past consumer have delegated their genomic data to testing companies who have generated massive profits from this data while the consumer has not profited at all. Zenome’s CEO, Alexey Gorbachev, says that their goal is to reverse this trend. A similar company to Zenome is Israeli based DNAtix. DNAtix has built a blockchain platform where users can initiate a data transfer of DNA sequence and allow people to have their genes sequenced anonymously. The platform allows users DNA to be connected with an encrypted wallet from which users are at liberty to participate in research and receive tokens as rewards. Besides Zenome and DNAtix there are also other startups like Genome.io, Luna DNA, EncrypGen, Nebula Genomics, and Shivom that specialize in securing users genome from sequencing to usage. The platforms have various distinction but they are all geared to help customers to sell or donate genomic data at their own discretion. Geneticist maverick, Professor George Church from Harvard recently stated that “right now, genome sequencing is like the internet back in the late 1980s. It was there, but no one was using it.” The vanguard of Blockchain and Genomics is steadily advancing. The benefits are there to be seen by all as briefly described in this paper. Going into the future more research and thought will go into refining these aspects but one thing is sure this is only the beginning, greater things lie ahead.